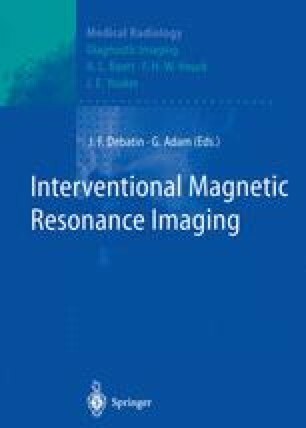 The excellent soft tissue contrast of MRI, its multiplanar imaging capabilities, and detailed delineation of anatomic features gave rise to the concept of MR-guided biopsy. The first attempt to realize this idea was reported by Mueller et al. (1986), who described phantom trials for needle visualization, as well as MR-guided aspiration biopsies of liver masses. Other groups followed with applications in the head and neck, but also in the abdomen, musculoskeletal system, and breast (Lufkin et al. 1987,1988; Lufkin and Layfield 1989; van Sonnenberg et al. 1988; Duckwiler et al. 1989; Pitt et al. 1993; Greenstein Orel et al. 1994). The first specially designed commercially available aspiration biopsy needle was developed and introduced by Lufkin et al. in 1987.